Beauty is a very quiet and gentle golden with a sweet and undemanding disposition. Beauty is unique in our family of goldens in that she has a very interesting pedigree with a combination of both European AND American multichampions (some of which can be found in the Golden Retriever Hall of Fame - Such as Glenru's Rusty Nail and Asterling's Wild Blue Yonder). Beauty is the darkest of our goldens but she brings with her excellent bone structure and well-balanced movement along with a wonderful thick coat and a kind, expressive face. She has inherited the wonderful full-boned look of her father and the intelligent, loving temperment of her mother. Beauty produces beautiful full-bodied pups with great structure and charming personalities. 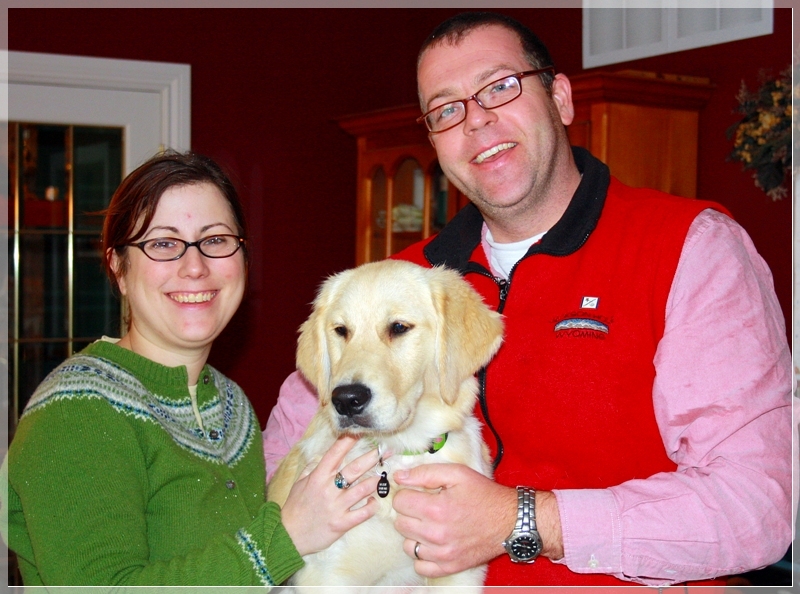 Our thanks goes out to Sandy Baur at Snowy Pines Goldens for allowing this lovely girl to come and stay with us. After years of caring and tending to her own beautiful boys and girls - in October 2009 we decided to let Beauty put her feet up and enjoy some much deserved R&R. Beauty is now enjoying a life of retirement and is being spoiled and pampered to her heart's content by the Harter family - where she happily lives with her daughter Maisie. We wish Beauty the very best as she lives out her "golden" years in comfort. Beauty now resides with the Harter family - shown here with Beauty's daughter Maisie. The last days of fall 2008.